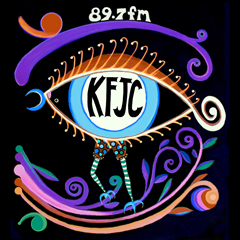 Shawn is a mixed-media artist and musician originally from Michigan whose connection to KFJC goes back to 1997, when she co-hosted a 5-hour Mayhem special on New Zealand music. She subsequently moved to NZ for a couple of years, where she played in Dating Godot, before moving back to Michigan and, more recently, to Oregon. She likes to draw, paint, and “turn the past into the future with old, discarded items.” She has also done graphic design for musicians such as Robert Pollard (GBV) and Richard Davies (The Moles) and her twin passions of music and art converge nicely with her designing KFJC’s 2016 fundraiser “girlie” shirt.